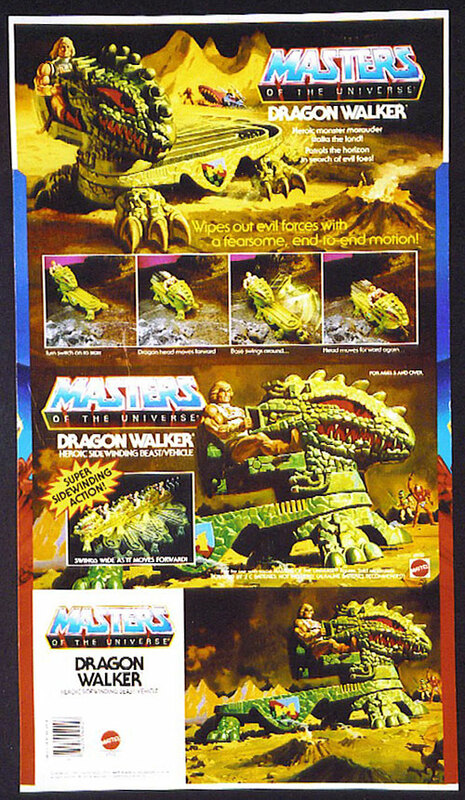 The Dragon Walker is one of my all time favorite Masters of the Universe vehicles. 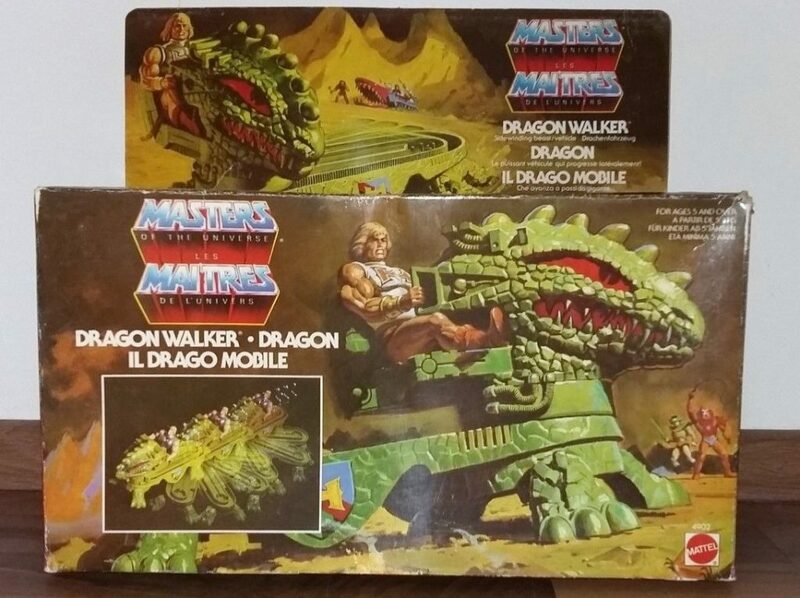 I don’t recall if I had seen the Dragon Walker at the store and begged my parents for one, or if they surprised me with it for my birthday. I just remember getting it and frantically searching the house for a pair of C batteries. As I recall we didn’t have any and I had to wait for my parents to buy some. What an agonizing wait that was. 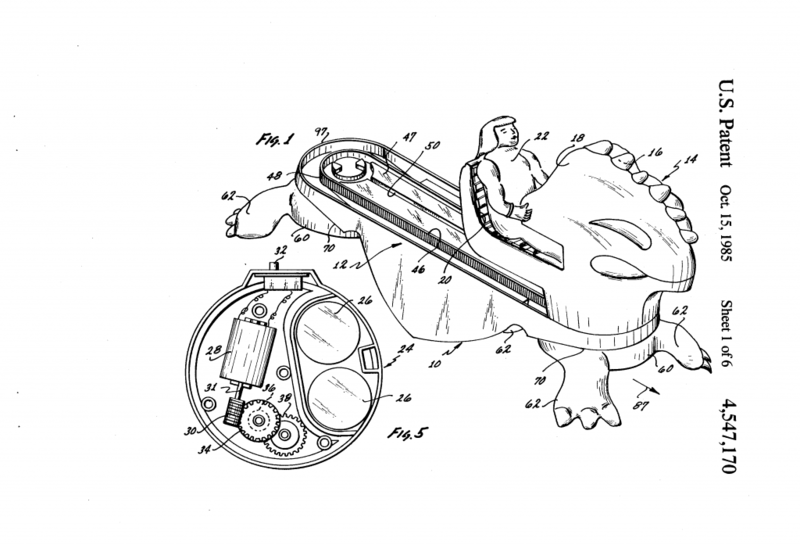 I realize some fans find the sidewinding locomotion concept to be so impractical that it has soured them on the toy. Not me. 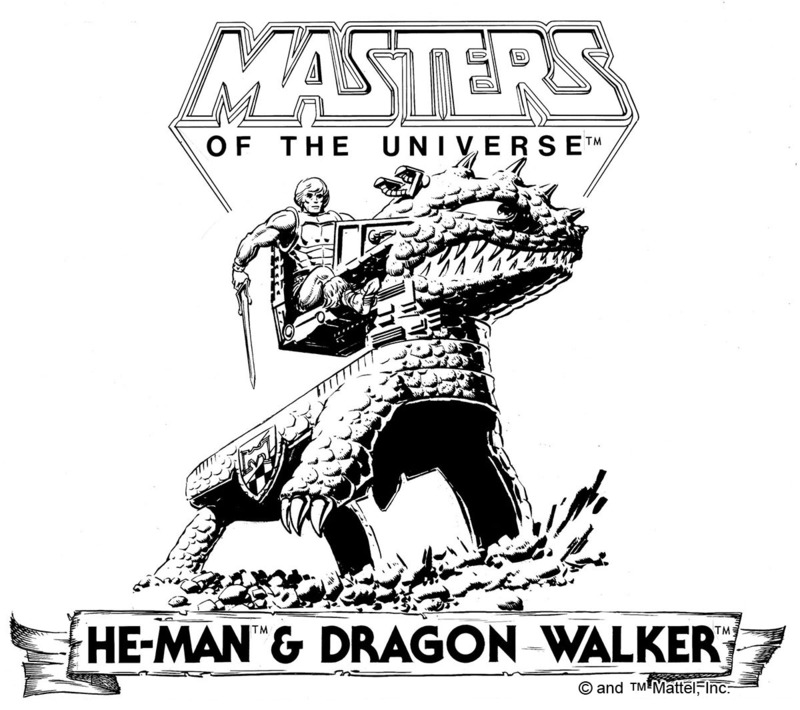 I thought of the Dragon Walker as the Eternian equivalent of the G.I. Joe Bridge Layer – a vehicle built for getting the good guys across rivers and crevasses. 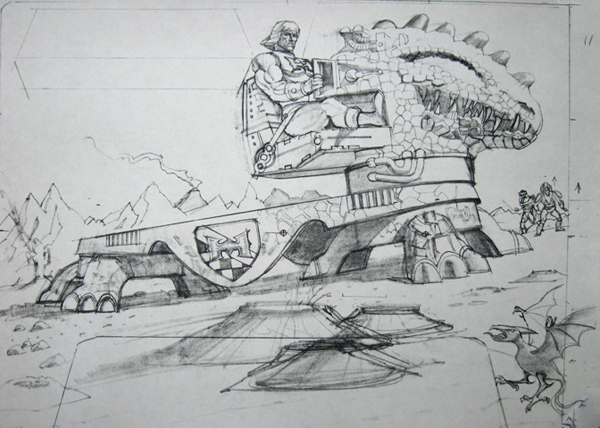 The main elements of what would eventually be the Dragon Walker are present in this concept illustration by Ed Watts. 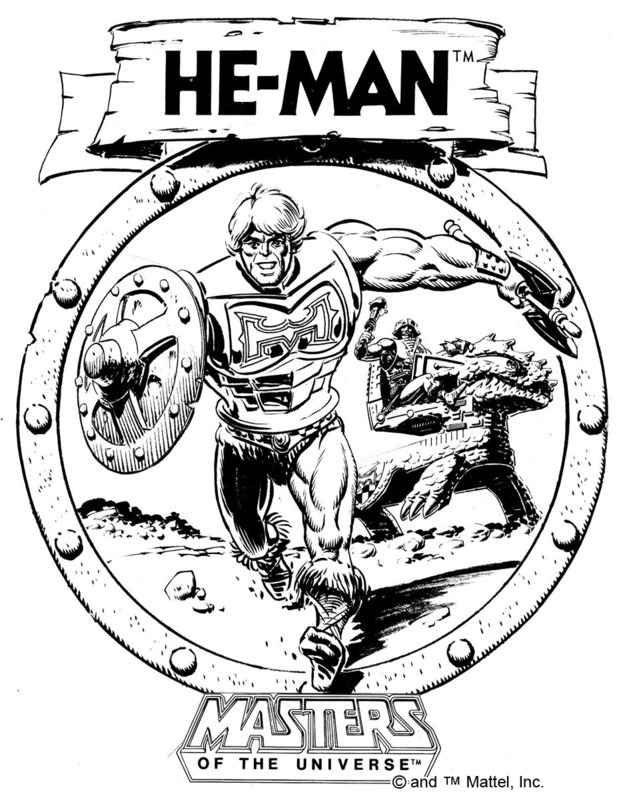 The coat of arms design is different from the final toy, featuring a cross and dragons rather than the stylized H from Battle Armor He-Man’s costume. 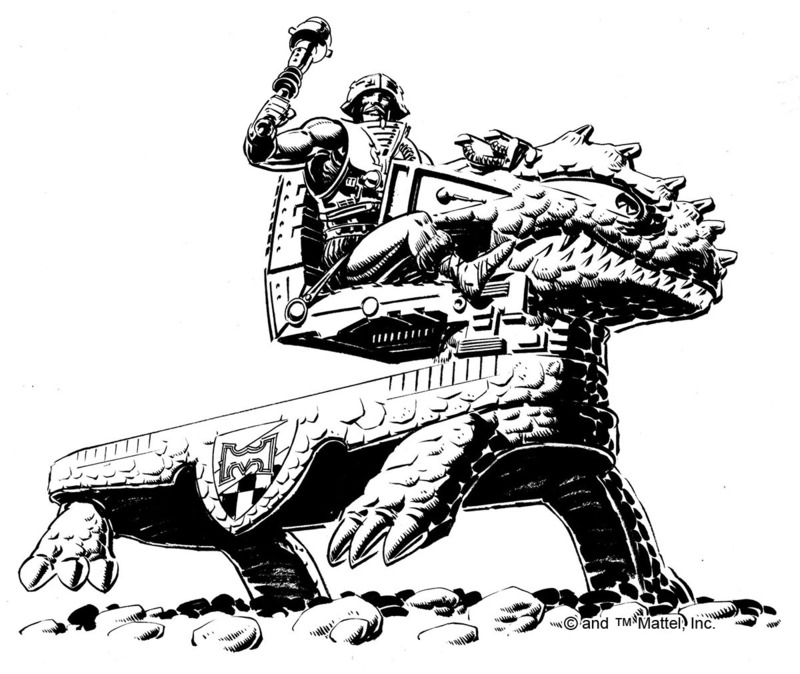 In this concept the driver stands rather than sits, and holds on to a red laser canon mounted on the dragon’s head. The concept was also quite a bit larger than the actual toy. 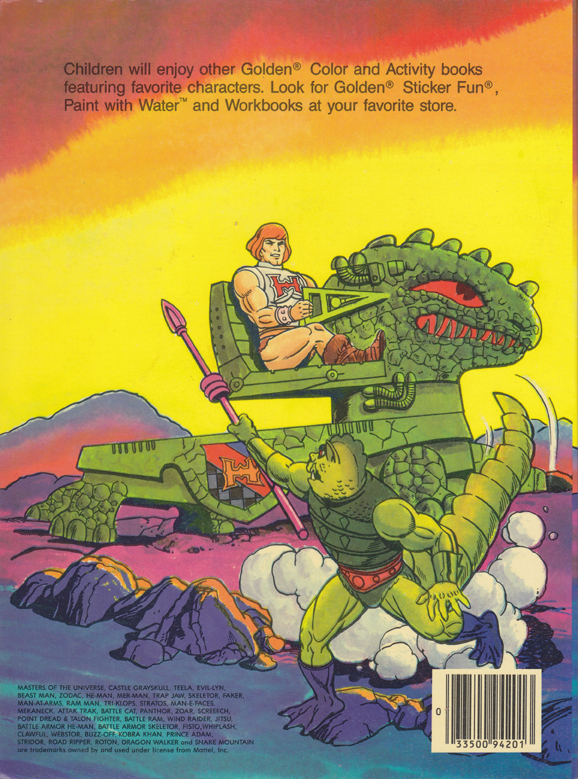 William George painted the packaging illustration, which features Battle Armor He-Man riding the Dragon Walker through a prehistoric-looking landscape. 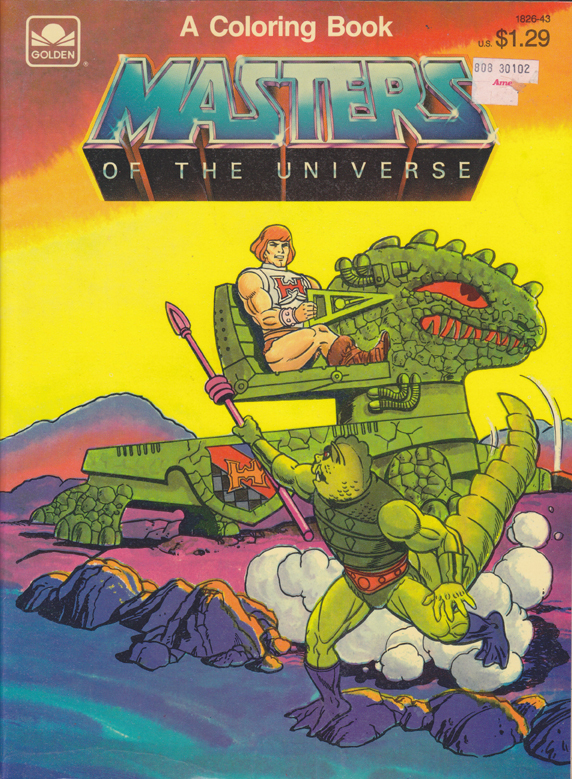 One hallmark of many of George’s MOTU illustrations is the presence of little dinosaur-like creatures off to the side of the main action. Original William George line art. Image via He-Man.org. There was stuff I did not know about, because Mattel kept us designers isolated, regarding other departments, or outside stuff. 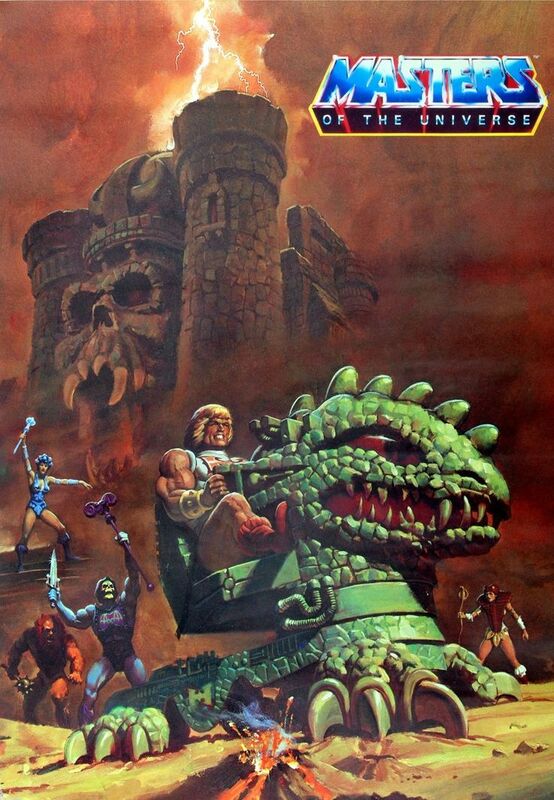 I remember that one day the He-Man posters appeared out of nowhere that were done for Kellogg. Apparently Marketing just went out and did them without consulting us. We were pissed off, because we considered ourselves the main reference point. As it happened, they hired Bill George to do them, and we were good buddies. Funny story. Bill came to me and said “I have to do these paintings for Kellogg’s, but they said I can’t sign them.” Because they were for such a big company he wanted the exposure. I had the same problem with the aircraft illustrations I used to do. I told him to hide his signature inside the illustrations, but do them upside down so they where not obvious. That’s what he did, and they never found it. 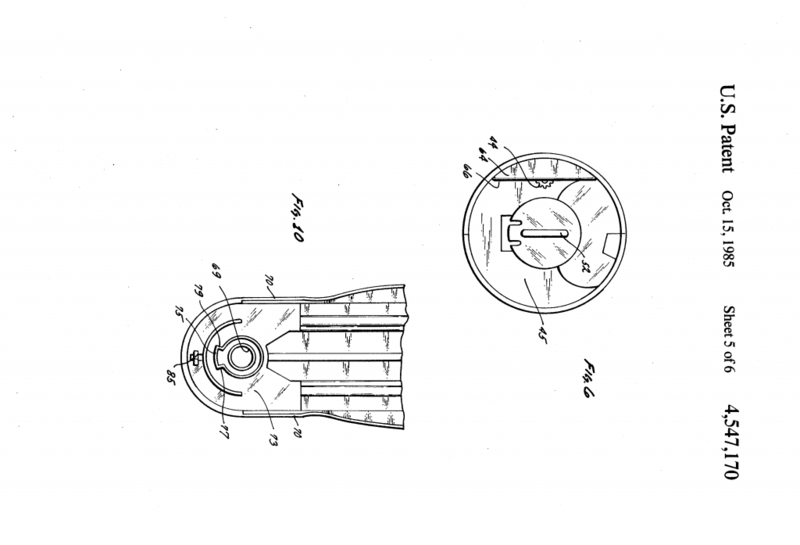 A moveable toy consisting of a base and a motorized vehicle. The base includes a track having a central groove ending in openings at either end. 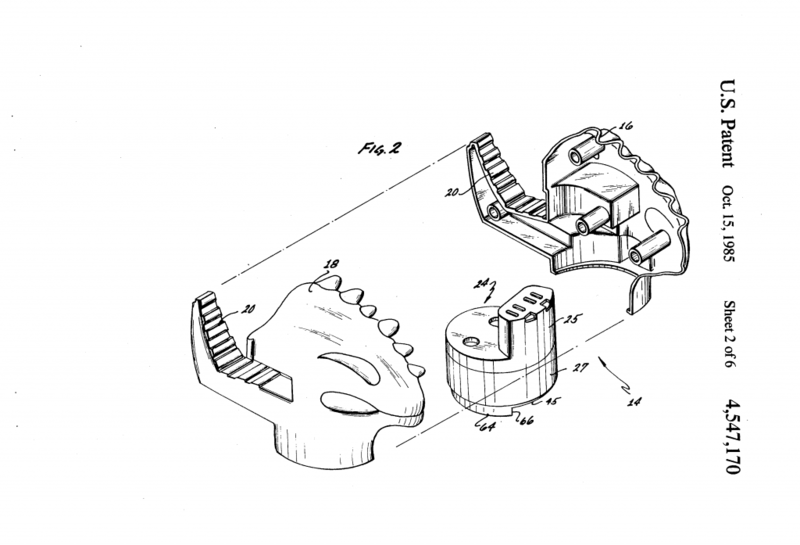 The track includes teeth which cooperate with a drive gear held in the vehicle to drive the vehicle along the track. Rotors having notches on the top surface are rotatably held in openings at each end of the central groove in the track. Upon actuation, the vehicle travels along the track until it arrives at either end of the track, where the vehicle rotates the base to allow the vehicle to continue along the track end for further movement of the toy in the same direction. 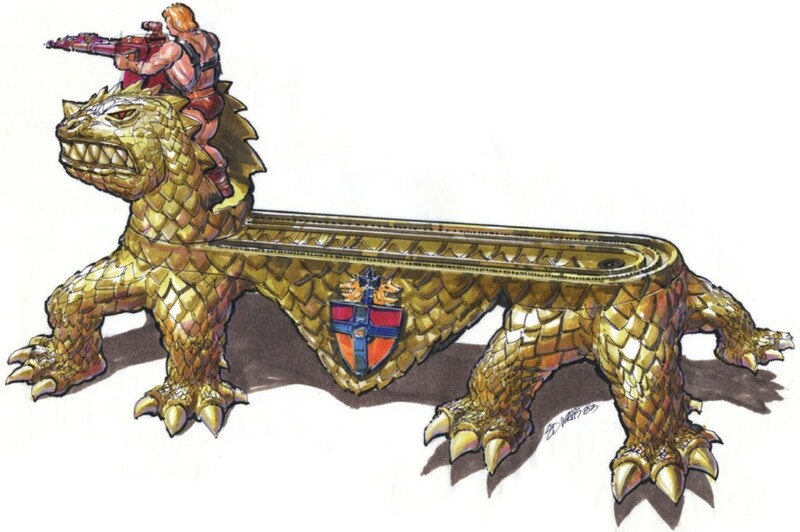 As an aside, Roger Sweet takes credit for the Dragon Walker in this interview, although it’s unclear what his contribution was, other than perhaps managing the project. 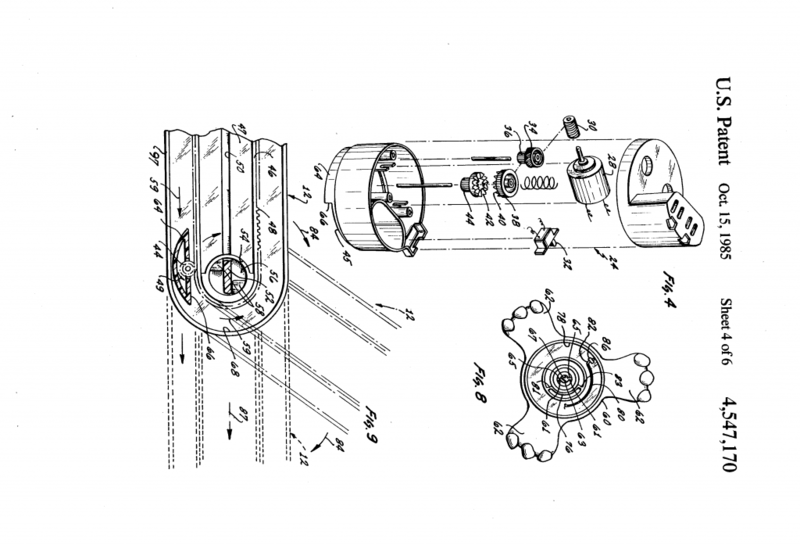 He’s not listed as one of the inventors in the patent application, and the concept art was done by Ed Watts, as mentioned earlier. 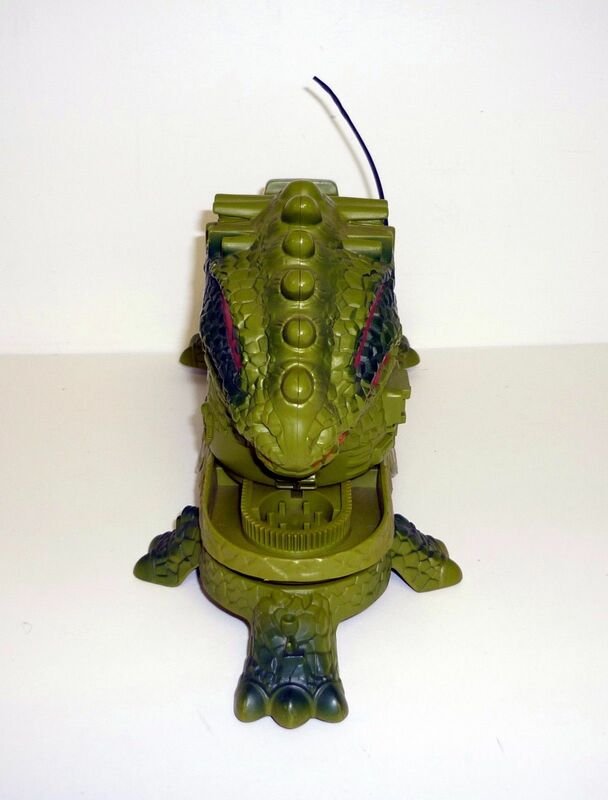 The other one is made by Mattel, and Tim remembers the crowds of people watching this with fascination, the first time it was shown at a toy fair. 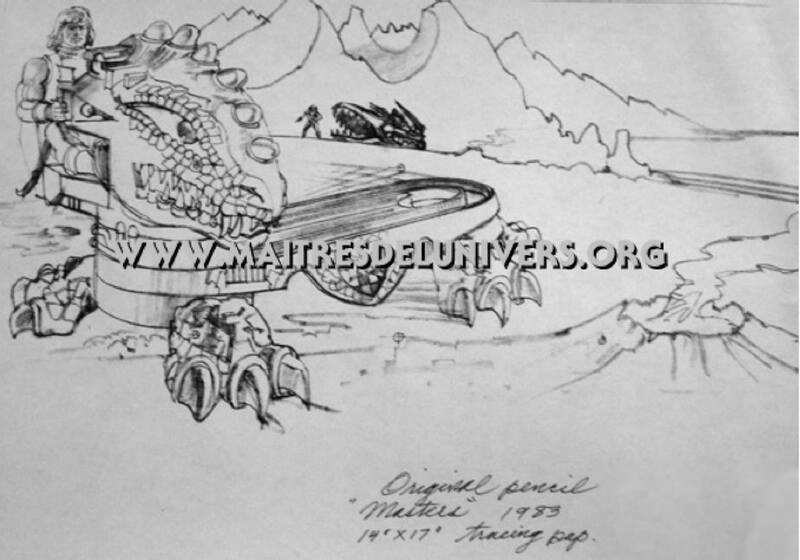 The character drives his dragon vehicle along the track; once he reaches the end of the track, the track swivels around, so that the section of track that was behind him is not in front of him, and he can set off again, along the track. This keeps repeating, and so he can cover quite large distances quite quickly, on his amazing ‘never ending’ track! 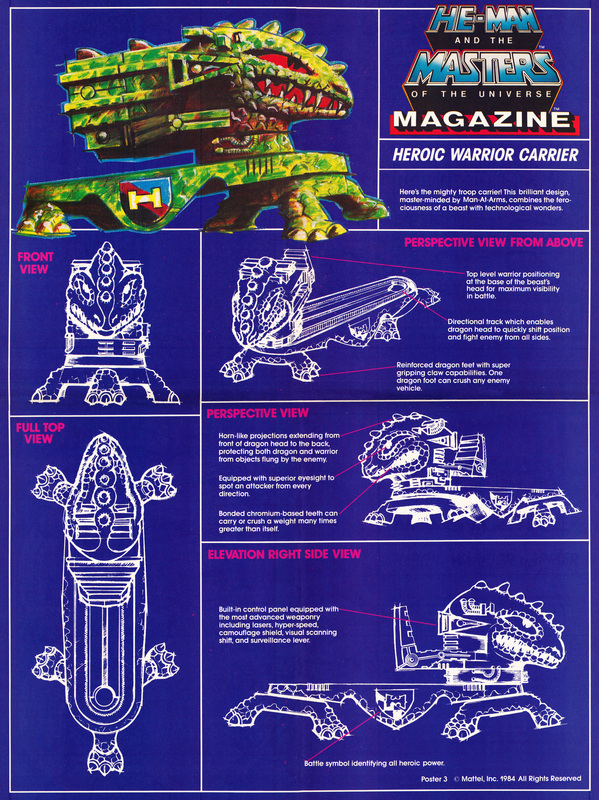 Curiously, the poster doesn’t identify the Dragon Walker by name, but instead calls it the Heroic Warrior Carrior. 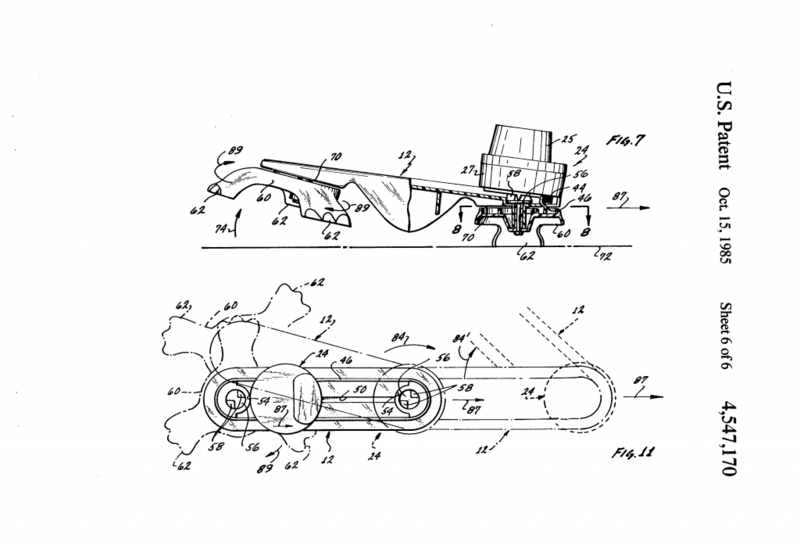 Man-At-Arms is said to be the inventor. Notice that the color version at the top is off-model. It resembles the Filmation version, but it’s not clear if there is actually any place for the driver to sit! 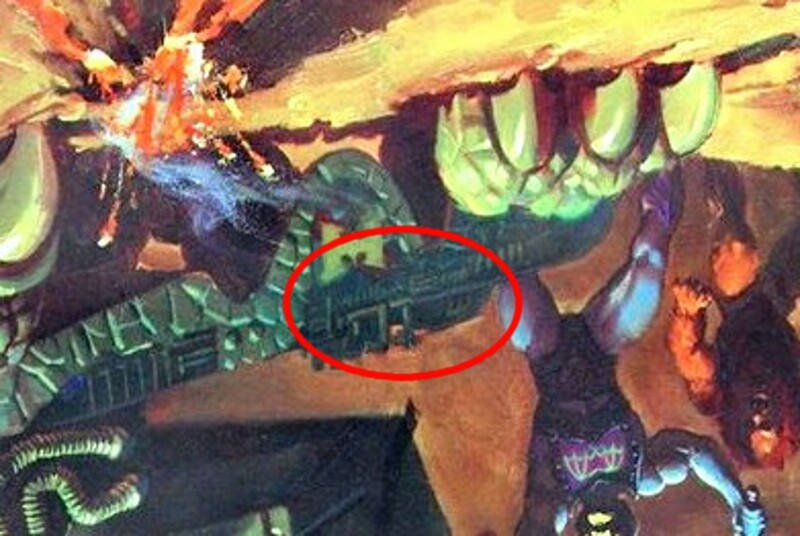 The Dragon Walker made an appearance in the background of the mini comic, Mantenna and the Menace of the Evil Horde! 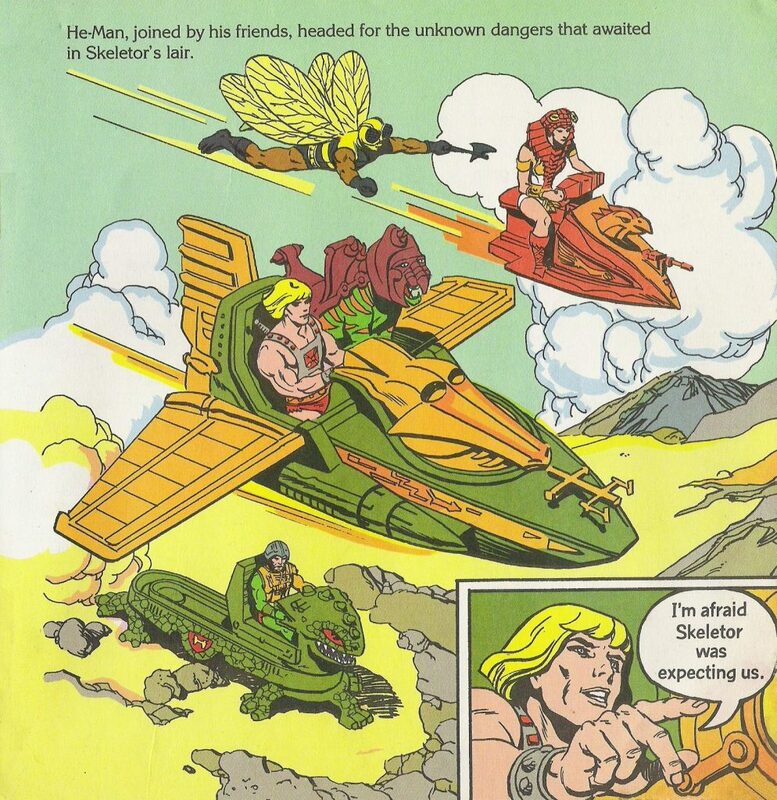 As shown in the above GIF and model sheet, Filmation increased the size of the seat so that it could fit multiple characters. Did anyone elses Walker get stuck? I recall mine some times getting to the tracks end and clicking. A quick nudge would send it on its way again. I remember mine getting a bit stuck at times, but mostly that’s due to dirt and uncleansed plastic which just needed a bit of work ^_^ I think UK releases seam to be a bit less quality from what I’ve seen.. and for some reason, seam the lest well known with some variants.. I need to check my box.. I think it’s in the loft now.. I love the way it was balanced. pretty well so the track would swing well and lift the back feet of the ground.. the ‘never-ending’ track idea.. I don’t think it was 100% original at the time but it was pretty new and impressive. Mine would occasionally do that (the one I had when I was a kid). The one I have now doesn’t get stuck, but it tends to veer left half the time. Just noticed… the ‘off model’ version on the poster… that is a more detailed version of the cartoon one.. notice you can see the tops of two rows of seats.. not quite the same of course, but that is more like the cartoon’s version. 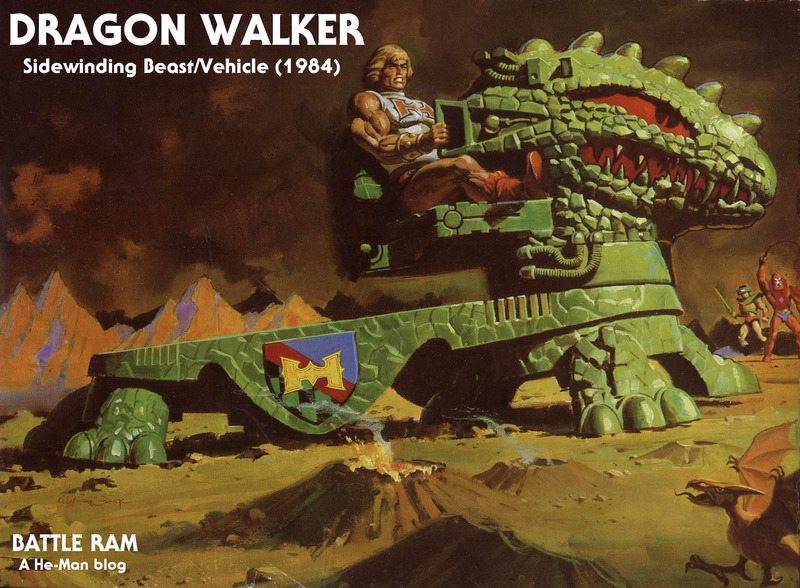 One of the things I really like about the Dragon Walker is that visually, it’s very much like Castle Grayskull. It’s a frightening titanic mythical creature made of stone with only a minute amount of technological circuitry. It’s way too Metal for milktoat heroes to be using! 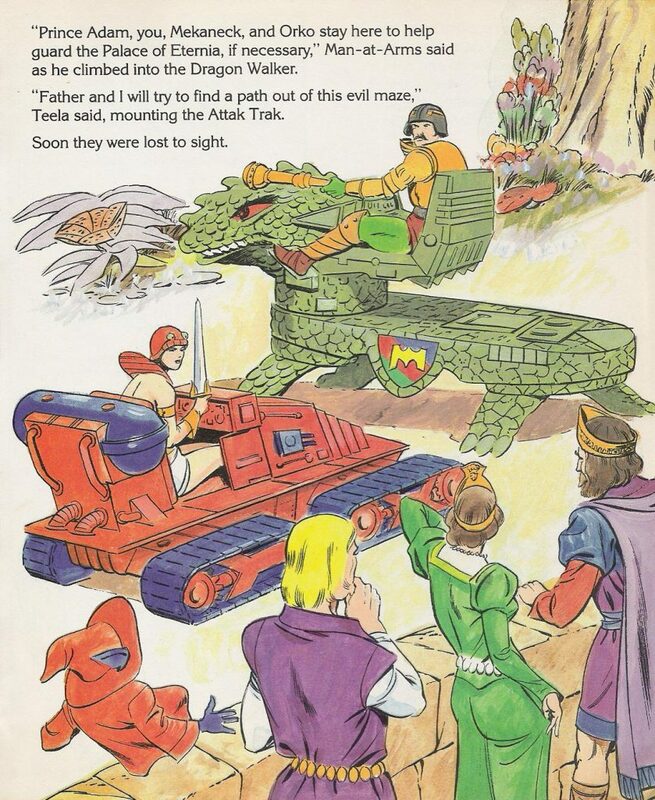 It’s also reminiscent of The Bionic Dinosaurs trio introduced in 1987. Their is a certain design philosophy that is continued into those creatures first seen with Sydor, Monstroid, Bashasaurus and Dragon Walker and to an extent Battle Bones. Even though the dino’s feel a little “fisher price”, they all “fit” together. 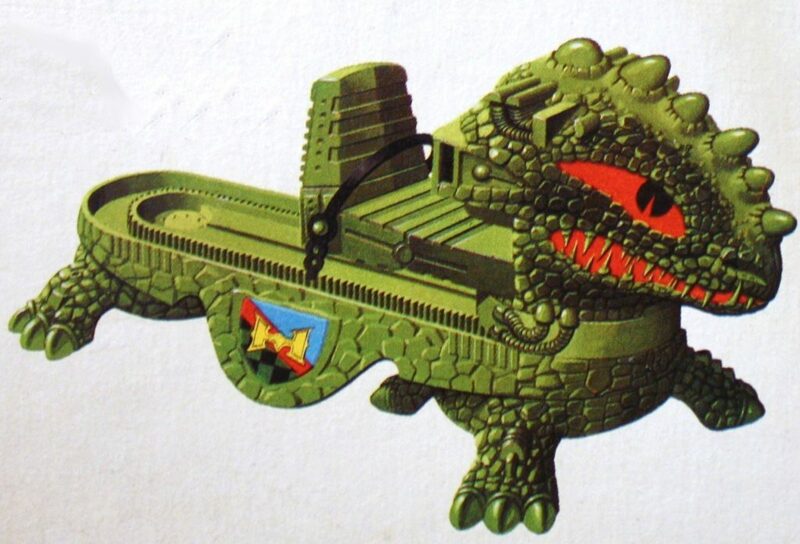 My favorite MOTU vehicles/Creatures have this (for lack of a better term) “Gear punk” look about it. Archaic semi mystical machinery: Harley Davidson meets Stonehenge. Anytime anything is too smooth, sleek, modern and aerodynamic it feels disconnected from the brand. Beam Blaster & Artillery, Jet Sled etc. have more in common with the New Adventure Galactic Guardian vehicles. They don’t “feel Eterninan” the way the Dragon Walker does. 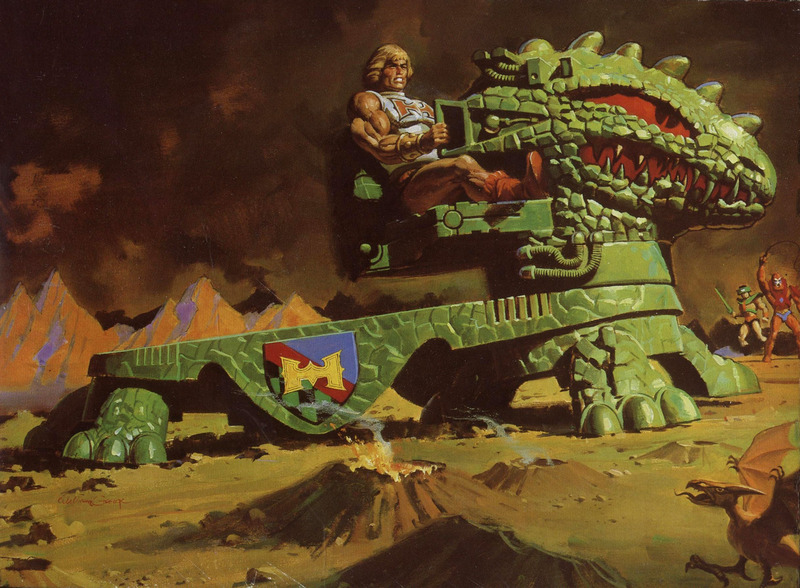 The Mutant Vehicles feel like they belong on Eternia. 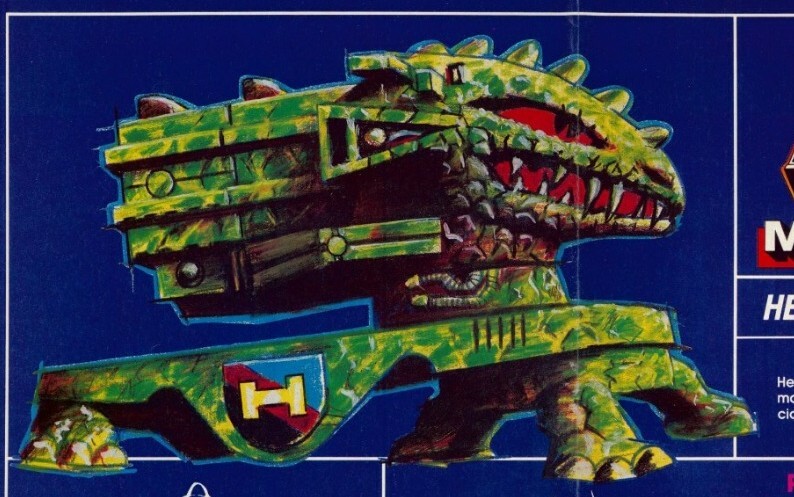 Certain Filmation vehicles like the Horde bat-Mek and Skeletor’s Collector have that “gear punk” esthetic even though they are clearly coming off a modern assembly line. 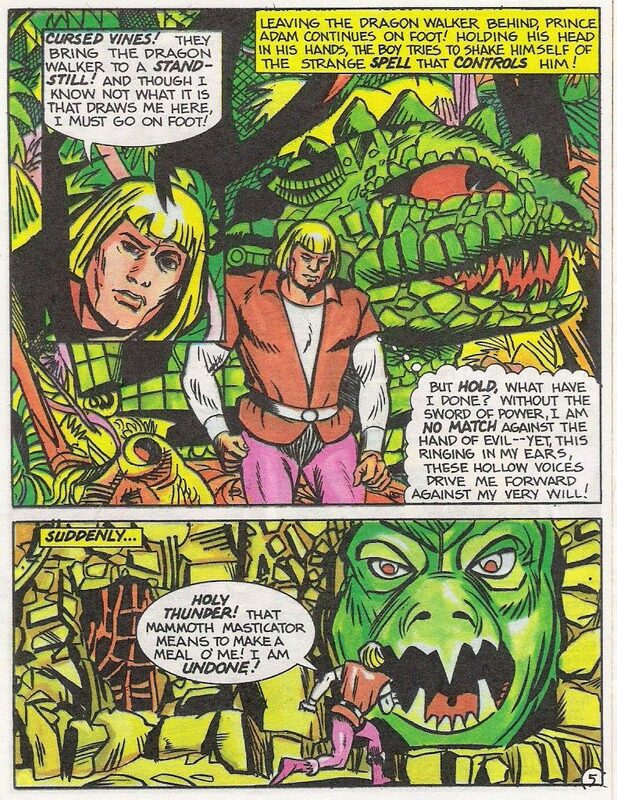 Eternian design philosophy aside, I just don’t accept that Duncan created this thing. At least he didn’t do so whole cloth. 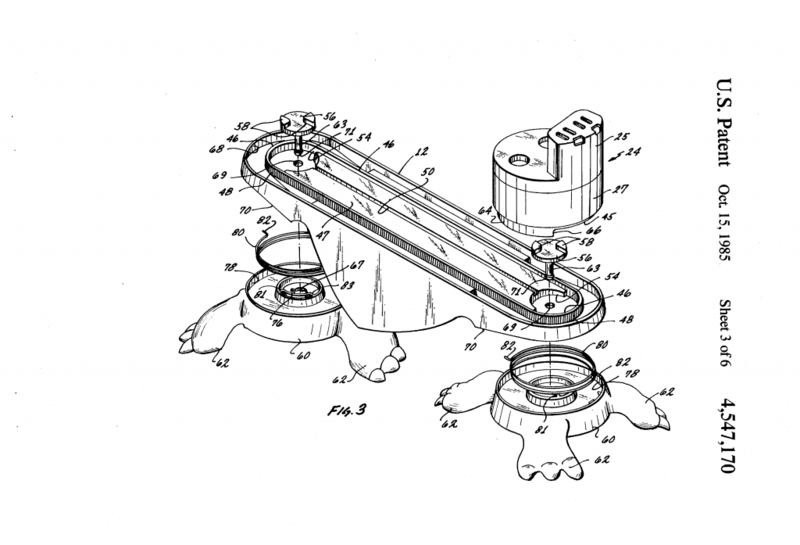 If man At-Arms invented this, I think it’s something he cobbled together from several other Preternian parts. (something he has been known to do from time to time being the “keeper of the secret of technology” that his linage is) I look at the Dragon Walker and I see a chair to some vehicle like the Windraider wielded to an ancient dragon sculpture with just touch of salvaged Attack Track parts to make the Bridging/bludgeoning mechanism function. 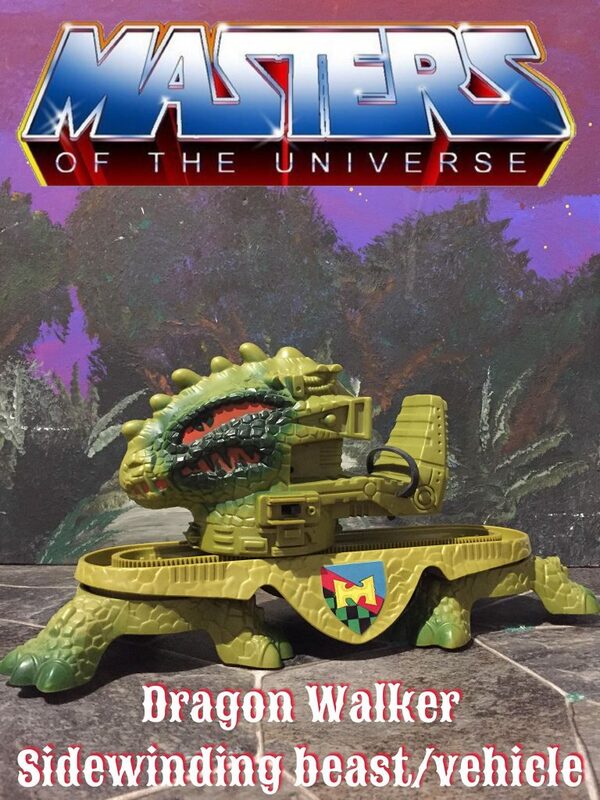 If this thing ever got an origin story, I would hope that the 1st man-At-Arms built this thing at dawn of the Eternian Dark Age in the intermediate aftermath of the Great Wars. 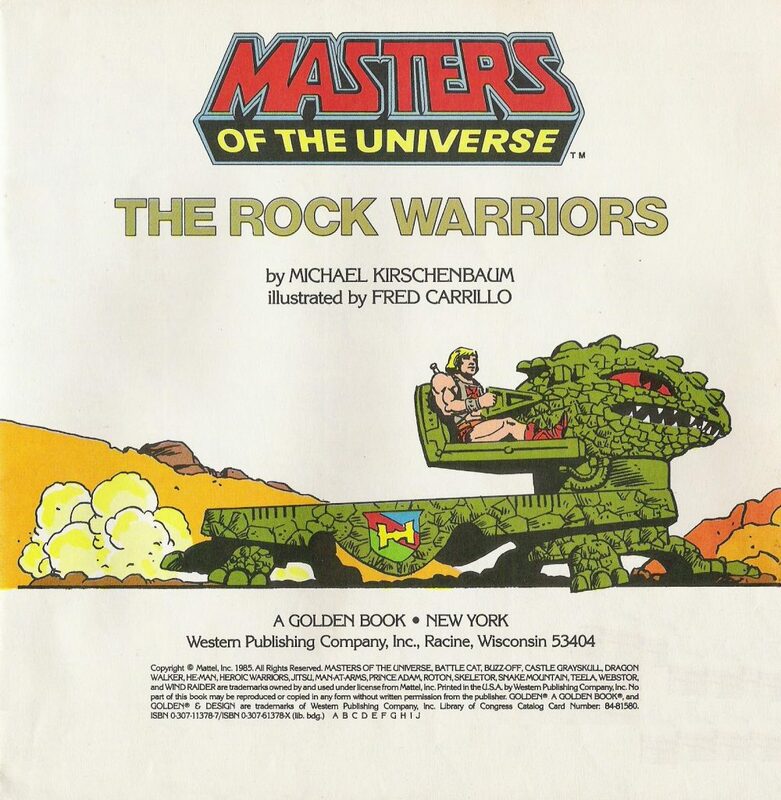 I’m sure he needed such a mechanical beast to traverse the now rocky and war torn post cataclysmic world. I imagine it’s builder made it in the image that he did because he misses the majestic creatures that no longer roam the irradiated waistbands. If he wasn’t such a recluse, I’m sure Granamyr would be humbled by the homage. Hey Shawn, those are some great observations. 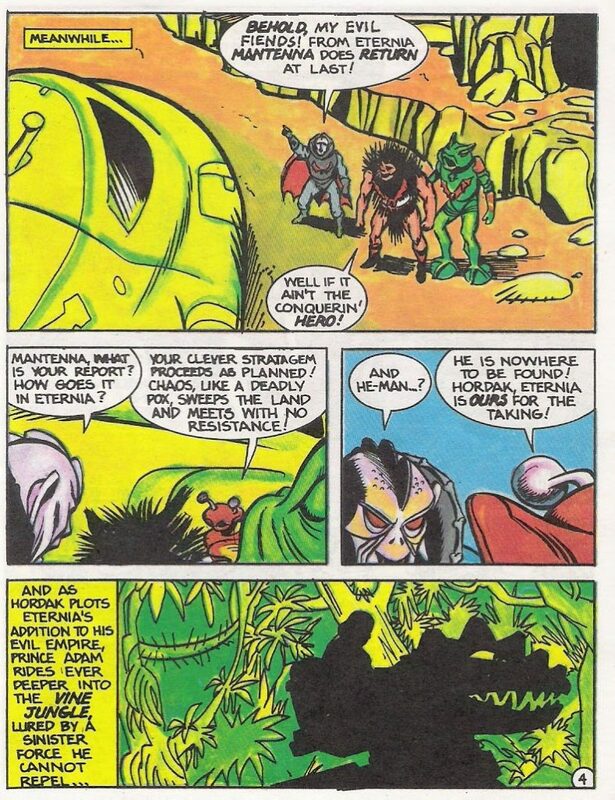 You’re absolutely right about the gear punk look in Eternian vehicles. 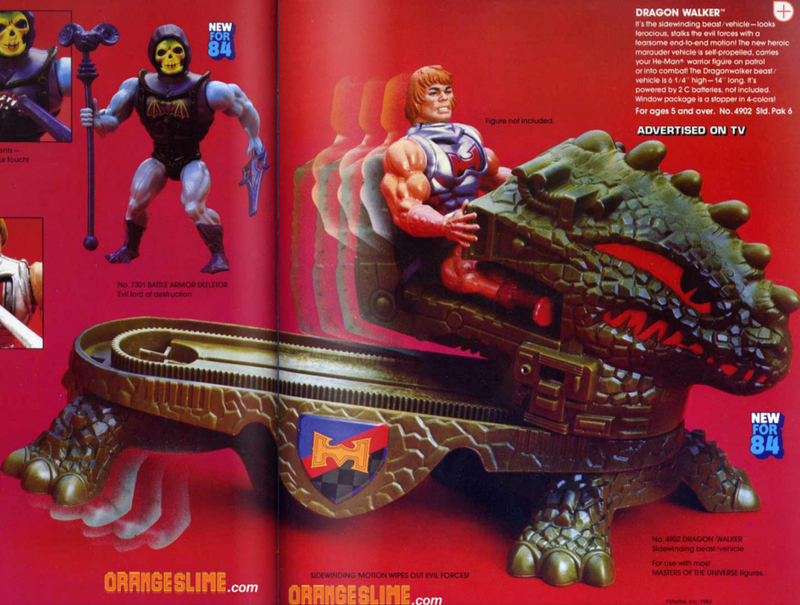 I do feel that in many ways 1986 heralded a sea change for the MOTU line. 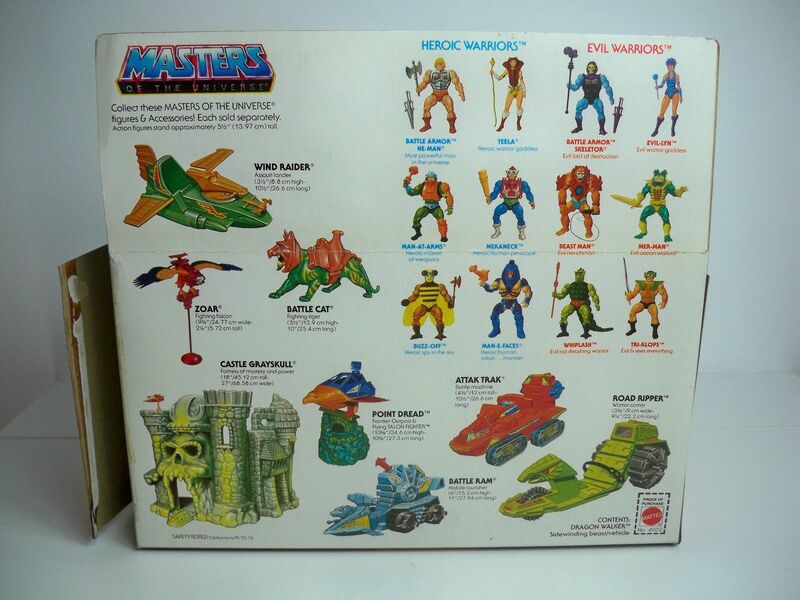 Some of the new items did feel very MOTU (the Snake Men) but others as you say were much sleeker and not in keeping with past stylistic elements. I agree with you. 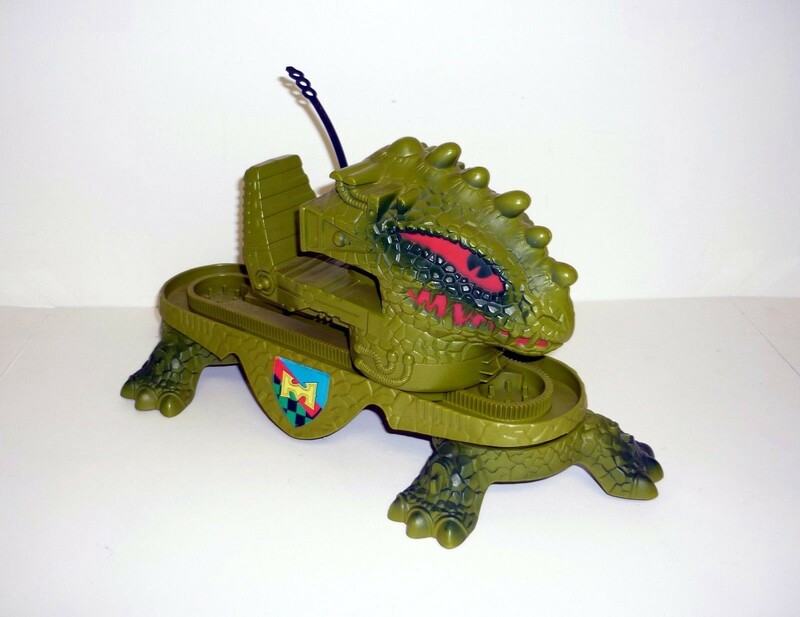 And by the way, I can’t believe that a patent was filed for this toy, since it was basically an Attack Track moving part rotated 90°. 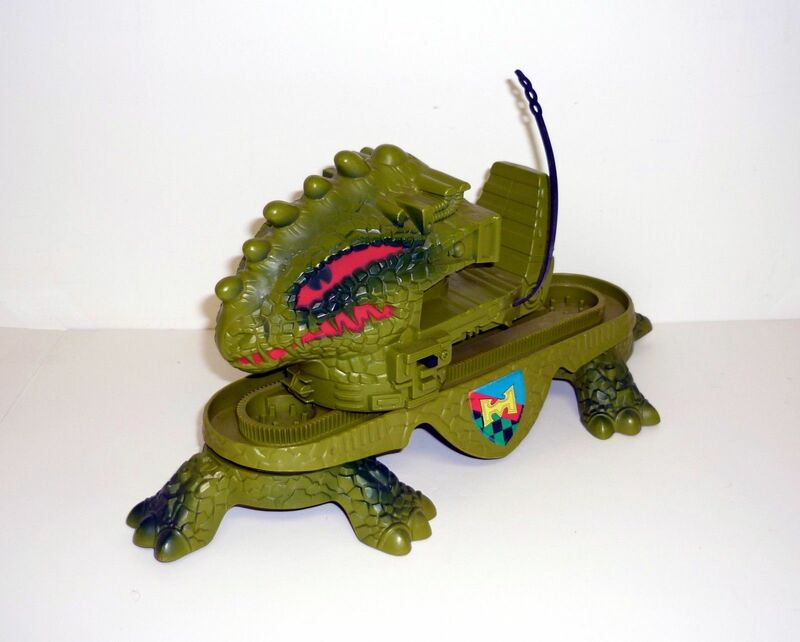 I loved the Dragon Walker though. I hadn’t thought of it that way, but you’re right! 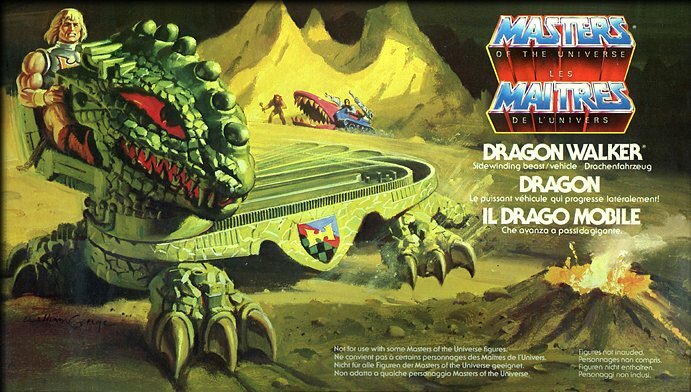 Always LOVED the Dragon Walker art. Fantastic article once again! 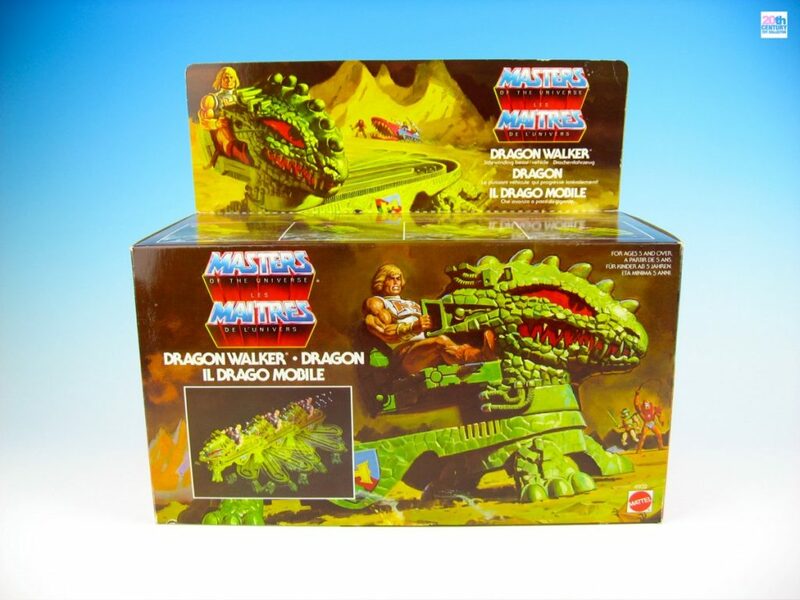 I love the Dragon Walker, I remember seeing it second hand a lot and not really getting how it worked so I’d never bother with it but once I learned the hunt began. The place I bought it from didn’t even know it worked until they luckily had some C batteries behind the counter, it was mint too! What a steal! 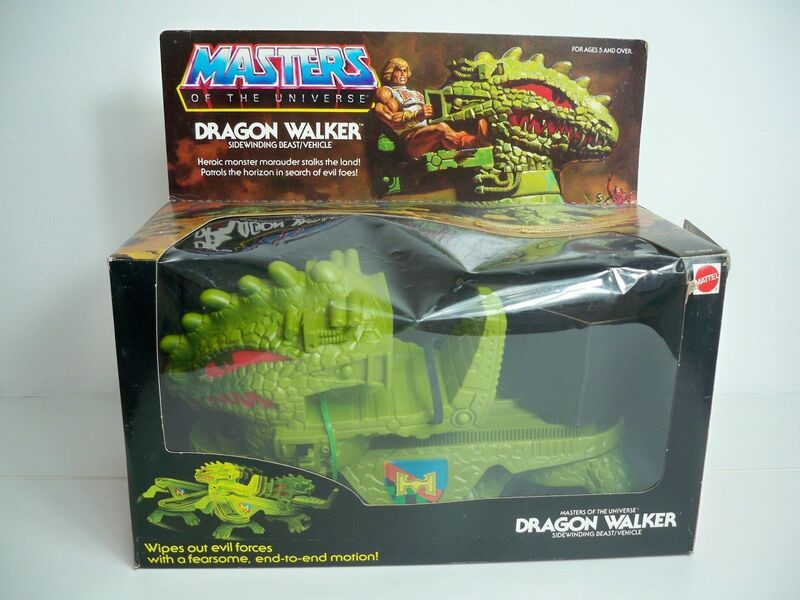 I regard the Dragon Walker as the most interesting vehicle of the entire line; it is not my favorite but is very unique and ingenious toy. I never had it but I saw it in action at another kid’s home and was amazing (its only noticeable flaw is that is very noisy).